उनकी ज़ुबान, उनके अशार ! ज़बाने बदलते हैं : आशा भोसले के साथ ‘मीर’ के अशार. उसपर राग मारुबिहाग का रोग़न .तो तस्वीर का दिलकश बनकर सामने आना लाज़मी है. मंडी फिल्म का ये गीत कम सुनाई और लोगों की जानकारी में कम आपाता है .उतना ही कम इस संगीतकार का नाम जिसे वनराज भाटिया कहते हैं . परदे पर स्मिता पाटिल अपने एक अलग अंदाज़ में. 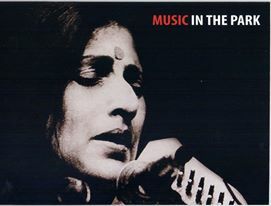 From very old days when I first listened to Kishori Amonkar I call her the Epmress of Aalaap and I still consider her as the “आलाप साम्राज्ञी’ in the Indian musical firmament. Sharing a song from the film Drishtee in which Kishori Amonkar not only sung this exquisite beauty of a song replete with superb Aalaaps but also composed the music as well. With the introduction of the initial 48 second beauty of Aalaap from 0:12 to 1:00 and then followed by another three exquisite Aalaaps of 25, 17 and 26 seconds from 1:41 to 2:06, from 3:04 to 3:21 and 4:29 to 4:55 the song ‘Mehaa jhar jhar barase re… ‘ is kind of a showcase of Aalaaps decorating a song and composition to its possible beast. सहेलिया साजन घर आया हो …. at times I feel as if I am visualizing the Bhakt Shiromani Mera Bai singing this when I listen to Kishori Tai rendering this and believe me the kind of nuances and expressions she introduces while singing it live are beyond the realm of language ! here is one song that brings, not one or two, but 11 different raags to you in about 7 minutes!! The singer is one Haimanti Sukla [of the Chashm-e-Baddoor fame, and a fairly well known bong in the Hindustani circles]. And this comes from a 1982 movie [Sweekar Kiya Maine], with a post-her-moment Usha Khanna at the helm..! The raagas are: भैरव, गांधारी, मालकौंस, बागेश्वरी, मुल्तानी, हमीर, सोरठ, जैजैवंती, दुर्गा, बहार and बसंत. इतनी चतुराई की चीज़ है कि ‘राग-भाव’ बनाना, और वो भी in less than a minute each, और ऊपर से पूरे ग्यारह रागों की बात कर रहे हैं… आनंद..!! छाई बसंत, ऋतु मन भानी. 00:07 aakaar of BHAIRAV followed by the नामकरण+elaboration – all done impressively in the next 55 seconds! 01:02 ==> यहाँ गच्चा है कुछ – मेरे लिए. वो गा रही है: “गांधारी संग हैं स-स-रे-नि-स-रे-ग-म” – ये समझा नहीं अपुन भिड़ु 🙂 – did the raag change here for just the next 11 seconds?! 01:13 MALKAUNS is the next course in tonight’s fantabulous मिष्टान-पकवान-भण्डार dinner for your soul 🙂 A slow and short सरगम-तान starting at 01:29 is… adequate. अभी तो लोहा और गर्म होना है! Total duration of Malkauns: 40 seconds, helped by the Sarangi and Ms Sukla’s decent taan! 01:53 BAGESHREE is sort-of whisked in from the neighborhood of Malkauns! चुरा लाए, भगा लाए… But she doesn’t want to be seen much 🙂 13 seconds! HOW DO YOU BRING A RAAG LIKE BAGESHREE IN FOR JUST 13 SECONDS? hmm! 02:06 अब आई MULTANI की बारी: nice entry, lilting lady from Sindh-Multan 🙂 She seduces you in a mere 37 seconds. 02:43 HAMIR परिवार की ठंडक में आ जाएं..? जैसे एक बड़े से मंदिर का शीतल फ़र्श..! भजन-कीर्तन का समय हो गया न..?!! परन्तु केवल 24 seconds का साथ रहेगा. 04:23 DURGA – पधारी माँ..! अगले सिर्फ़ 38 seconds में इन्होंने आपको दया-वरदान भी देना है, और अपनी रीढ़ सीधी रखने को उत्तेजित भी करना है..! बाएँ हाथ का खेल है जी… भवानी है आख़िर 🙂 The taans start at 04:33, and show us a glimpse of Haimanti’s ‘Amonkaarii’ – मतलब ये भी वैसा ही एक मोड़ लेती हैं texture में… gliding into something a little heavier and then gliding back into her usual मन्द्र-सप्तक texture… this happens from 04:38 to 04: 41… the taans finish at 04:50., then 10 seconds of the santoor. बताओ..! !